The F10 generation of the BMW 5 Series is making its final laps in what has been a productive life, and the M5 is set to bow out too. This car, the BMW M5 Competition Edition, is a last hurrah for the super saloon, and what a goodbye it is. 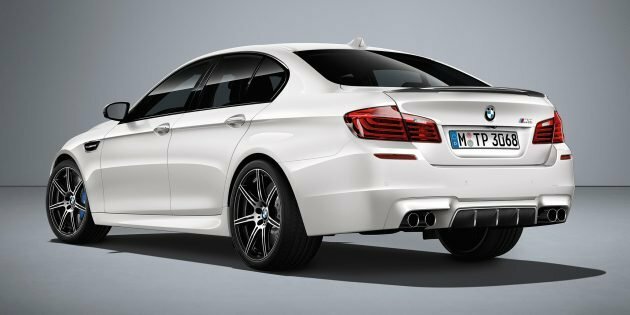 Only 200 units of the M5 Competition Edition will be made. Both the 4.4 litre twin-turbo V8’s power and torque have been upped, from 560 hp and 680 Nm to 600 hp and 700 Nm, and increase of 40 hp/20 Nm. This is thanks to more boost courtesy of a recalibrated ECU. 0-100 km/h is done in just 3.9 seconds, half a second faster than the standard M5’s 4.4 seconds. Top speed is electronically limited to 250 km/h. Six-piston caliper brakes are mounted within 20-inch M double-spoke 601M light alloys, finished in high gloss Jet Black. Black wheels aside, the M5 Competition Edition is identifiable by its carbon fibre BMW M Performance Parts (rear spoiler, rear diffuser and mirror caps) and a black kidney grille. There’s an ‘M5 Competition’ logo on the side ‘gills’. Only two exterior colours are available: Mineral White and Carbon Black. Inside, occupants benefit from Full Black Merino leather upholstery with Opal White contrast stitching, along with details such as the unique “1/200” engraving. The same white is also used for the M5 logo that now appears on the head restraints of the M Sport multi-function seats, and for the piping of the floor mats. The next-gen G30 5 Series is just around the corner now, and the M5 version of that car has recently been caught testing. And BMW Malaysia will never sell below their cost. Goes to show, even at RM270k they still making untung. So, last time, they made untung of nearly RM200k per F10 car sold! Get your facts right first before posting illegitimately. Hello Dr Ray, BMW salesman, go look at mudah. Got RM288k. After I call, AB said can reduce to RM270k. Your own company put ad also you don’t know ah? Talk c**k. You sell RM270k is it? i dont see G can out sell new E class either..
internal internal…interior la bro. what la r u haha. but yeah agree with you that bmw interior is outdated already & can keep up with the merc interior. Previous Post: Proton Preve pikap UTE oleh Bufori – Proton sedang membina trak pikap Arena generasi baharu?